With the scorching temperatures and late sunsets of summer now in the review mirror, it’s time to look ahead to see what is coming to Garden Valley this fall, winter and even spring. 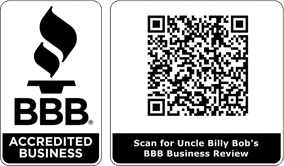 For those in need of lodging, Uncle Billy Bob’s is running a special for the aforementioned seasons that our valued customers can take advantage of at any time. Let’s take a look at the special below, then examine some of the many activities guests of Garden Valley can take advantage of in a respective season. Our lodging special, as seen below, is ideal for individuals, couples, families, or small travel groups. Be sure to check out pictures of the trailers on our website! *Sorry, cannot be combined with any other discount. Only Valid September 15th – May 15th. After an exciting summer, which included our famous (some may even say “infamous”!) 4th of July celebration, community members and guests of Garden Valley now have a variety of activities to look forward to this fall. For starters, people who love to spend time outdoors can take in nature’s beauty in one of the many scenic trails that surround us. Hiking, mountain biking, and horseback riding are among the many things guests can enjoy. We all have a hunter in our lives who literally counts down the days until hunting season starts in the fall. Fortunately for our hunting friends, the trails of Garden Valley have are ideal for a hunting outing, and Uncle Billy Bob’s will be a comfortable place to come back and relax after a long day outdoors! Additionally, when the weather is still nice, guests can enjoy golfing and array of watersports! A winter visit to Garden Valley, ID is very popular among our guests. Uncle Billy Bob’s is conveniently located near a couple of downhill skiing facilities, and of course, guests of Uncle Billy Bob’s can enjoy cross-country skiing right out their front door! Other activities our guests enjoy during the winter include snowmobiling, and sleigh and wagon rides. Depending on when you come, springtime offers a nice mixture of the highlights of summer and winter. Perhaps it will be warm, and you can enjoy a wide range of outdoor activities, or perhaps there will still be snow on the ground, and you can still enjoy skiing, snowmobiling, and other fun endeavors in your winter coat! Regardless of what time of the year you come, you will be treated to friendly, warm, cozy and comfortable lodging after choosing Uncle Billy Bob’s. We can help you find a wide variety of activities that will best suit your personal preferences, or if you just want a nice quiet escape, we can provide you with that as well. For more information, or to take advantage our special package, please give us a call at 208-462-5BOB (5262).